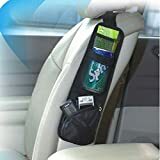 Name: Car Side Seat Tidy Organizer? Greenery US shop provides a 90-day money back guarantee! So just take it easy when you purchase our products. For more products in our shop, you can search “Greenery US” on Amazon website. Thanks! *Delivery reliable, USPS / UPS/DHL tracked, usually shipping within two business days! Ideal for all car owners for keeping your car clean, tidy and organized which prevents things from getting lost and your vehicles interior getting damaged.